In a small village somewhere in France, a group of friends stare in silent contemplation of the notice that has been posted in the town square. The French government has called for a General Mobilization of the country’s armed forces, and everyone that’s able is asked to join up with the army. It’s August 2, 1914, and what those men could not know are the horrors that lay ahead in the trenches. In the critically acclaimed game, The Grizzled, players take on the role of these soldiers and must struggle to survive what would become known as The Great War. In the new The Grizzled: Armistice Edition, the game is expanded with a campaign that spans the entire length of the war, bringing in new scenarios, new recruits, new rewards, and new hardships for everyone. Also included are new highly detailed, pre-painted miniatures of the different Grizzled in the game, lovingly recreated from Tignous’ original artwork. 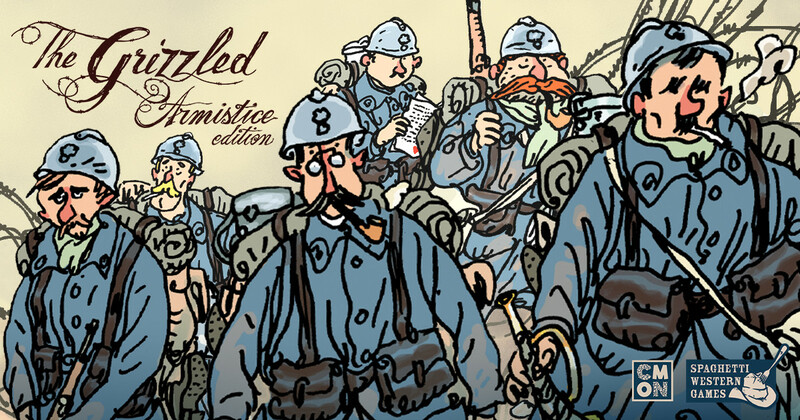 The Grizzled: Armistice Edition maintains the same tense gameplay as the original, with players looking to remove all the cards from the Peace card and avoid revealing the Monument card. They’ll do this by successfully completing Missions during each Chapter. At the start of each Chapter, players are dealt a number of cards determined by the Mission Leader for that round. Working together, players must try and play all the cards from their hand into No Man’s Land. Each card has symbols on it, representing the different weather and hazards (collectively known as Threats) that will be experienced during the Mission. If players can use every card in their hand while not reaching three of the same Threat on the board, they successfully complete the Mission. However, as soon as the third Threat of the same type is played, the Mission is a failure. When this happens, players will move cards from the Monument card to the Peace card, representing the war being that much harsher for the combatants. If the Monument is ever revealed, the players lose the Chapter and bad things happen to their morale and sanity. However, if they can manage to uncover the Peace card, then all is well, and they can move on to the next Chapter knowing they did their best. During a player’s turn, there are several Actions that they can take. The first is that they can play a card from their hand. Threat cards are placed into No Man’s Land and represent the various Threats the players will encounter during the Mission. Other cards are Hard Knocks. These represent the various hardships that can happen to a soldier during war, and will give a continuous detriment to a player who has them. Players can use a Good Luck Charm, if they have one. These are great at removing Threats from No Man’s Land. They can mean the difference between success and failure. Players with a Speech token can also make a Speech during their turn. With their inspiring words, a player can nominate a Threat out in No Man’s Land, then players can discard a card from their hand that shares the same type. Since players lose if three of the same Threat is in play, Speeches can also quickly turn the tide of a Mission. The final Action a player can take is to Withdraw. The battle has just gotten too intense, and they must head back. They can no longer play cards or get the benefits of Speeches. However, they will not be adding Threats to the Mission anymore. In this new Armistice Edition of the game, the different Chapters form a long campaign that will see the Grizzled take part in all the major events of WWI. From the assassination of Archduke Franz Ferdinand through the Marne and the Somme all the way to the Armistice that ended the war. With each Chapter, the Grizzled will face new challenges, as each battlefield has its own special scenario rules to follow. As they go, they’ll also meet up with fresh Recruits. Keeping these rookie soldiers alive isn’t easy, but the players get bonuses for having one make it all the way through their tour of duty. Each Chapter ends with various rewards, depending on how well the Grizzled managed to survive the Missions therein. The better they do, the greater the reward and the easier-going it will be in the next Chapter. However, failure breeds upon failure, and the Grizzled can really find themselves hurting if things start to go wrong over and over again. The carrying case for the Armistice Edition is custom-made to not only hold the cards for the game, but do so in a way that players can pause a Campaign at any point along the way, save their progress, and come back to it later. Card Dividers, labeled with the different Chapters, help separate out the cards, as well as spaces for individual player cards. When the Campaign is over, players will rate their score versus a chart showing how unscathed (or otherwise) they made out. Did the war have nearly no impact on their psyche whatsoever, or did it leave them bitter husks, hollow inside due to the tragedies they’ve seen? Only the players will know for sure. The Grizzled: Armistice Edition will be available in your FLGS on November 23. You can read more about The Grizzled: Armistice Edition here.